8 I will instruct you and teach you in the way you should go; I will counsel you and watch over you. 9 Do not be like the horse or the mule, which have no understanding but must be controlled by bit and bridle or they will not come to you. 10 Many are the woes of the wicked, but the LORD’S unfailing love surrounds the man who trusts in him. 11 Rejoice in the LORD and be glad, you righteous; sing, all you who are upright in heart! A Psalm of David. Maschil — That David wrote this gloriously evangelic Psalm is proved not only by this heading, but by the words of the apostle Paul, in Ro 4:6-8. “Even as David also described the blessedness of the man unto whom God imputed righteousness without works. Probably his deep repentance over his great sin was followed by such blissful peace, that he was led to pour out his spirit in the soft music of this choice song. In the order of history it seems to follow the fifty-first. Maschil is a new title to us, and indicates that this is an instructive or didactic Psalm. The experience of one believer affords rich instruction to others; it reveals the footsteps of the flock, and so comforts and directs the weak. Perhaps it was important in this case to prefix the word, that doubting saints might not imagine the Psalm to be the peculiar utterance of a singular individual, but might appropriate it to themselves as a lesson from the Spirit of God. David promised in the fifty-first Psalm to teach transgressors the Lord’s ways, and here he does it most effectually. Sin is the cause of our misery; but the true believer’s transgressions of the Divine law are all forgiven, being covered with the atonement. Christ bare his sins, therefore they are not imputed to him. The righteousness of Christ being reckoned to us, and we being made the righteousness of God in him, our iniquity is not imputed, God having laid upon him the iniquity of us all, and made him a sin-offering for us. Not to impute sin, is God’s act, for he is the Judge. It is God that justifies. Notice the character of him whose sins are pardoned; he is sincere, and seeks sanctification by the power of the Holy Ghost. He does not profess to repent, with an intention to indulge in sin, because the Lord is ready to forgive. He will not abuse the doctrine of free grace. And to the man whose iniquity is forgiven, all manner of blessings are promised. It is very difficult to bring sinful man humbly to accept free mercy, with a full confession of his sins and self-condemnation. But the true and only way to peace of conscience, is, to confess our sins, that they may be forgiven; to declare them that we may be justified. Although repentance and confession do not merit the pardon of transgression, they are needful to the real enjoyment of forgiving mercy. And what tongue can tell the happiness of that hour, when the soul, oppressed by sin, is enabled freely to pour forth its sorrows before God, and to take hold of his covenanted mercy in Christ Jesus! Those that would speed in prayer, must seek the Lord, when, by his providence, he calls them to seek him, and, by his Spirit, stirs them up to seek him. In a time of finding, when the heart is softened with grief, and burdened with guilt; when all human refuge fails; when no rest can be found to the troubled mind, then it is that God applies the healing balm by his Spirit. God teaches by his word, and guides with the secret intimations of his will. David gives a word of caution to sinners. The reason for this caution is that the way of sin will certainly end in sorrow. Here is a word of comfort to saints. They may see that a life of communion with God is far the most pleasant and comfortable. Let us rejoice, O Lord Jesus, in thee, and in your salvation; so shall we rejoice indeed. Why is confession, a comfort to one’s mental state? How does repentance differ from confession? If confession is good, is guilt good? When is guilt not good? How does a believer demonstrate trust in God? In Christian tradition, the Great Commission is the instruction of the resurrected Jesus Christ to his disciples, that they spread his teachings to all the nations of the world. It has become a tenet in Christian theology emphasizing mission work, evangelism, and baptism. It has been a primary basis for Christian missionary activity. Some version of the great commission appears in Matthew, Luke, John, and in Acts, which is the second part of Luke-Acts. Details vary from book to book. In Matthew, Jesus directs the disciples to baptize people of all nations in the name of Father, Son, and Holy Spirit, the Trinitarian formula. 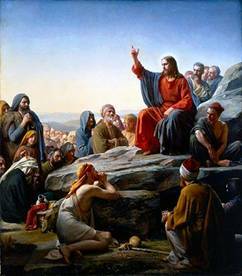 In Luke, Jesus tells the disciples to preach repentance and forgiveness, and promises that they will have divine power. In John, Jesus says the disciples will have the Holy Spirit and the authority to forgive sins and to withhold forgiveness. In Acts, Jesus promises the disciples that the Holy Spirit will inspire them. In Mark, Jesus never speaks with his disciples after his resurrection, since modern scholars agree that the original gospel of Mark ends at verse Mark 16:8 with the women leaving the tomb. The most familiar version of the Great Commission is depicted in the Gospel of Matthew 28:16-20. Other versions of the Great Commission are found in Mark 16:14-18, Luke 24:44-49, Acts 1:4-8, and John 20:19-23. All these passages are composed as words of Christ spoken after his resurrection. All that see the Lord Jesus with an eye of faith will worship him. Yet the faith of the sincere may be very weak and wavering. But Christ gave such convincing proofs of his resurrection, as made their faith to triumph over doubts. He now solemnly commissioned the apostles and his ministers to go forth among all nations. The salvation they were to preach is a common salvation; whoever will, let him come, and take the benefit; all are welcome to Christ Jesus. Christianity is the religion of a sinner who applies for salvation from deserved wrath and from sin; he applies to the mercy of the Father, through the atonement of the incarnate Son, and by the sanctification of the Holy Spirit, and gives up himself to be the worshipper and servant of God, as the Father, Son, and Holy Ghost, three Persons but one God, in all his ordinances and commandments. Baptism is an outward sign of that inward washing, or sanctification of the Spirit, which seals and evidences the believer’s justification. Let us examine ourselves, whether we really possess the inward and spiritual grace of a death unto sin, and a new birth unto righteousness, by which those who were the children of wrath become the children of God. Believers shall have the constant presence of their Lord always; all days, every day. There is no day, no hour of the day, in which our Lord Jesus is not present with his churches and with his ministers; if there were, in that day, that hour, they would be undone. The God of Israel, the Savior, is sometimes a God that hide himself, but never a God at a distance. To these precious words Amen is added. Even so, Lord Jesus, be thou with us and all your people; cause your face to shine upon us, that your way may be known upon earth, your saving health among all nations. An adherent of the doctrine of another; a follower. Why is discipleship so important to the Christian Faith?